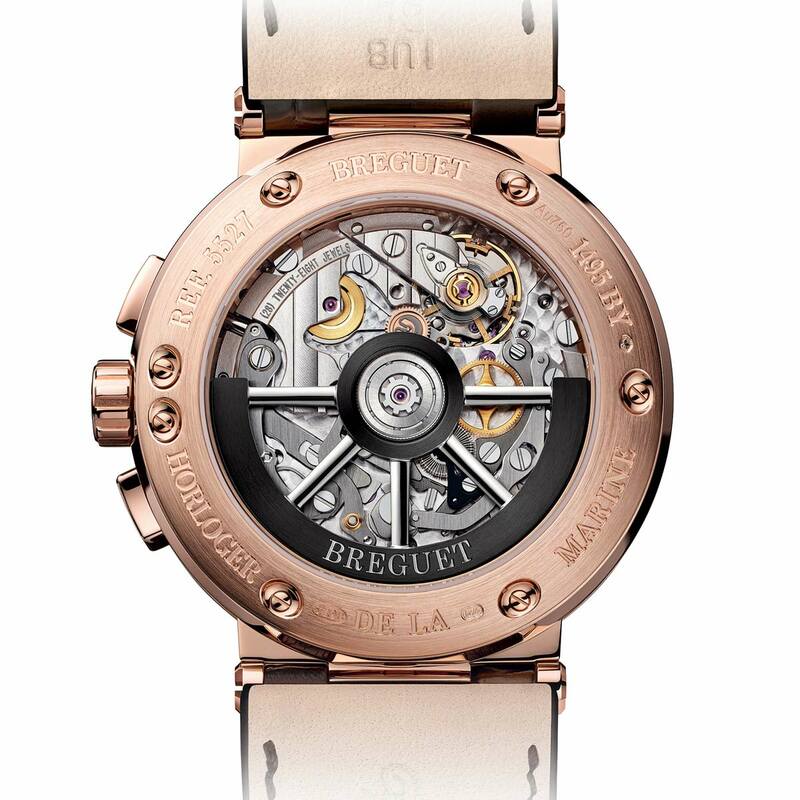 Following the overview of the Marine Collection introduced by Breguet at Baselworld 2018 and the article on the three-hand Marine 5517 model, we continue the presentation of the new references. 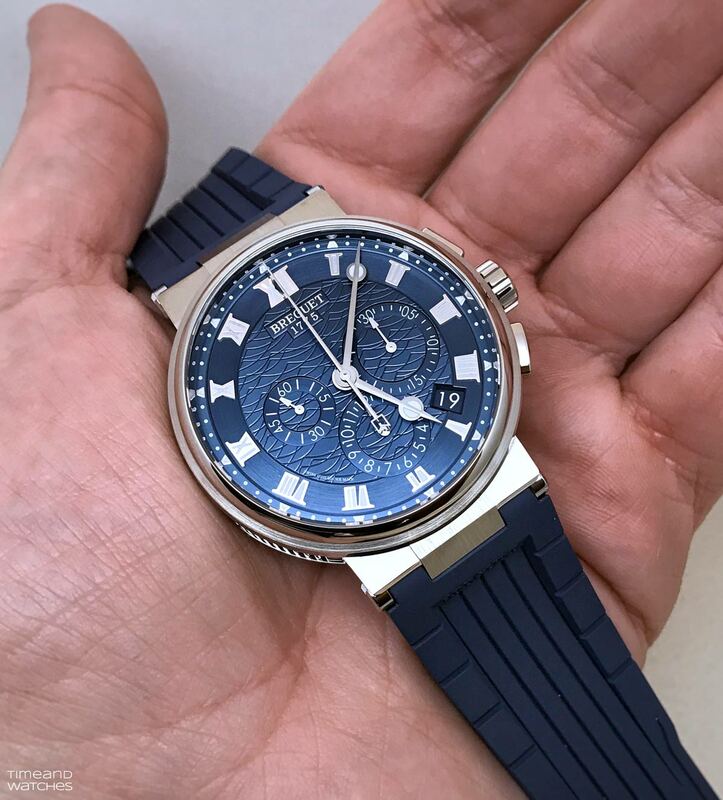 It is now the time of the Breguet Marine Chronographe 5527, featuring a complication which owes a lot to Abraham-Louis Breguet. Even before 1810, the great watchmaker designed timepieces with a seconds hand that could be started and stopped on demand. Later, he designed an ingenious inking chronograph with watchmaker and pupil Frédérick Louis Fatton. This instrument was equipped with a seconds hand which deposited, as required, a minuscule drop of ink on the dial, thus literally marking out a length of time. 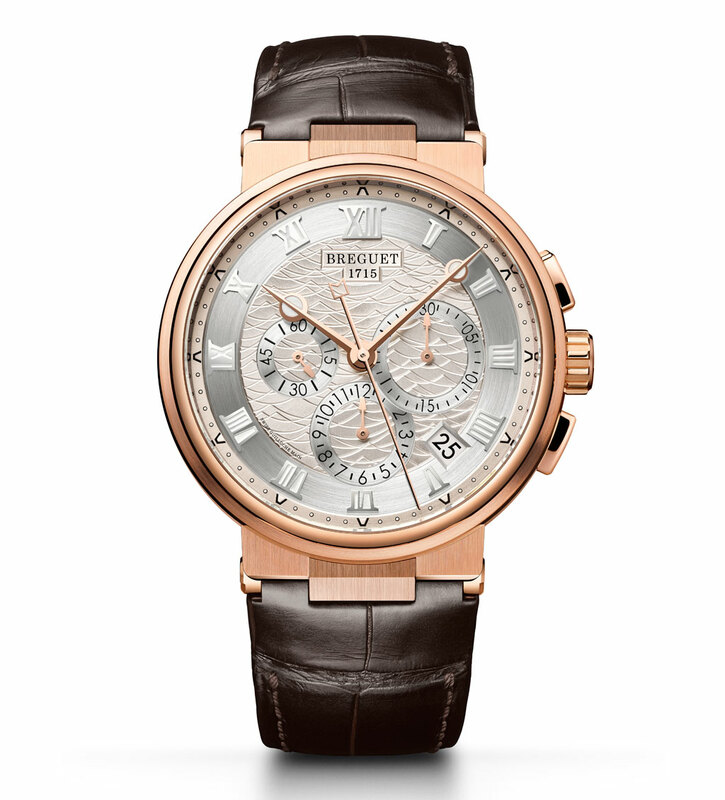 From 1820 onwards, Breguet also developed the famous “chronomètre à doubles secondes, dit d’observation”, the ancestor of all split-seconds chronographs. Hence, also considering that Abraham-Louis Breguet earned the prestigious official title of chronometer maker to the French Royal Navy, a chronograph watch could not absolutely miss in Breguet’s Marine collection. 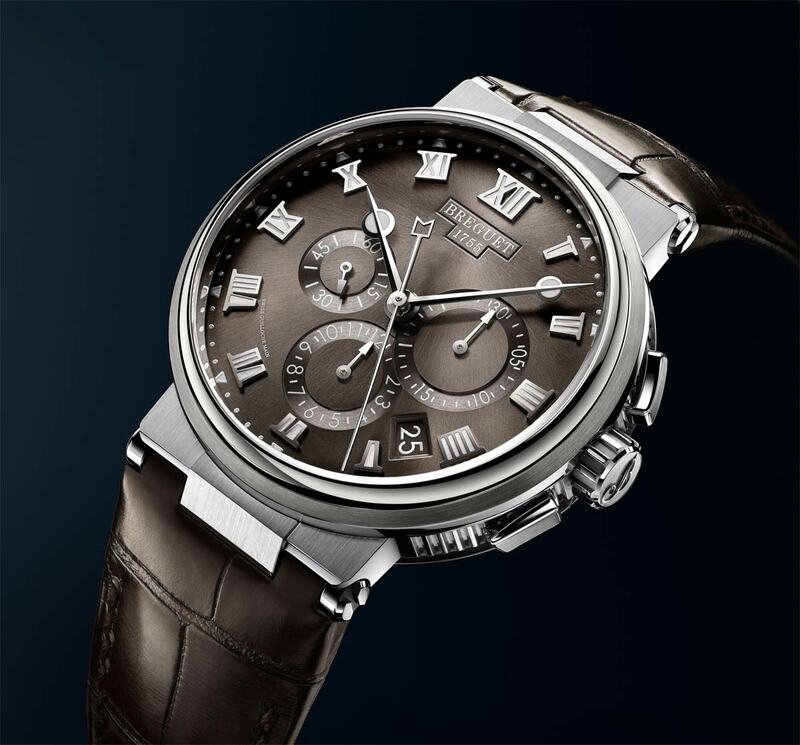 In line with the new design code of the line, the new Marine Chronographe 5527 features a 42.3 mm diameter case with the distinctive bracelet lug, the fluting on the caseband and the wave decor surrounding the crown, adorned with a large “B”. The cases ensures water resistance to 100 metres / 330 feet. The central chronograph hand, enriched by a “B” in a reinterpreted version of the corresponding maritime signal flag, is complemented by two registers, at 3 o’clock for the minutes and at 6 o’clock for the hours. The smaller sub-dial at 9 o’clock is used for the running seconds. The useful date indication is positioned between 4 and 5 o’clock. The Marine 5527 is available in three variations, two in gold and one in titanium, a material that is well suited for a marine-inspired watch thanks to its lightness and resistance to corrosion caused by salty air and water. 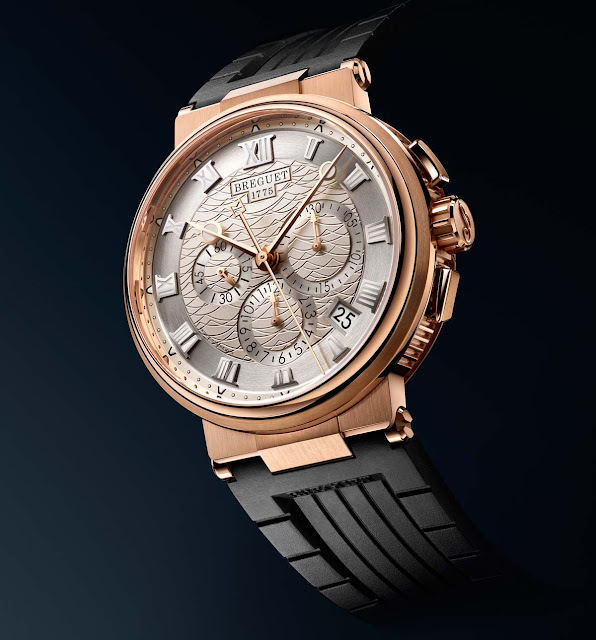 The white gold case is combined to a blue dial in gold while the rose gold comes with a silvered gold dial. The dials of both versions are enriched by a wave-motif engine-turned pattern. 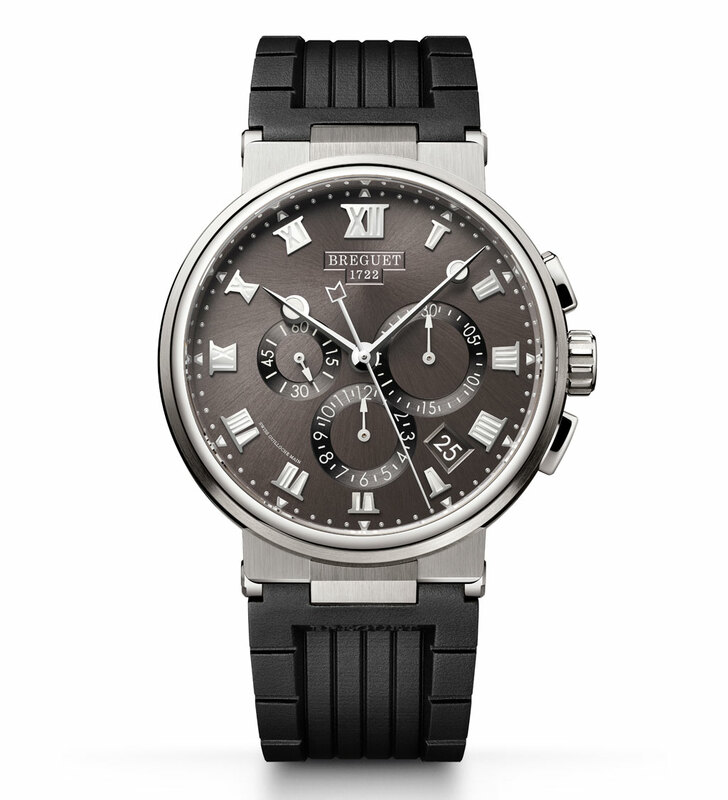 For the titanium version, the dial features an elegant slate grey tone with sunburst finish. The self-winding movement, Calibre 582QA, and its rotor with oscillating weight in black PVD-coated gold are visible through the sapphire crystal case back. The shape of the rotor was clearly inspired by a ship’s rudder. Beating at 28,800 vibrations per hour and offering a power reserve of 48 hours, this movement incorporates an inverted in-line Swiss lever escapement with silicon pallets as well as a silicon balance-spring. Silicon is impervious to magnetic attraction as well as highly resistant to corrosion and wear. Lighter and harder than steel, it reduces inertia and requires no lubricant. Moreover, the production method for silicon components makes it possible to create extremely complex shapes while ensuring extreme precision. 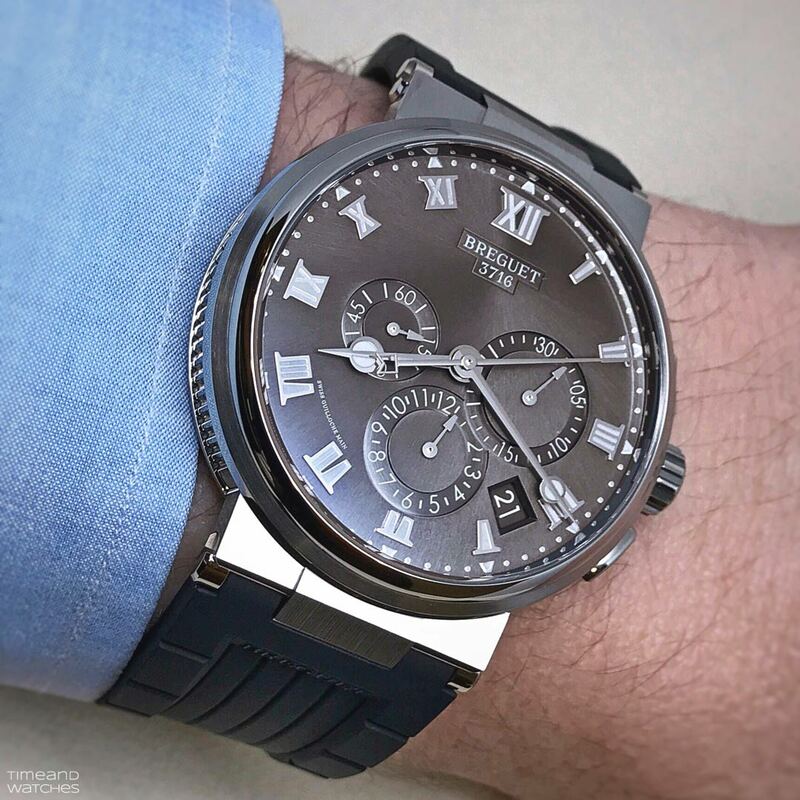 Baselworld 2018: Breguet Marine Chronographe 5527. The Breguet Marine Chronograph 5527, featuring a complication which owes a lot to Abraham-Louis Breguet. 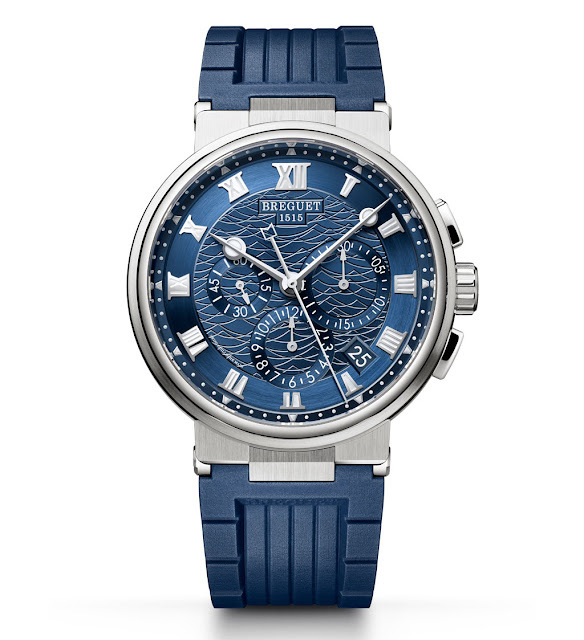 the Breguet Marine 5527 has a price of Euro 22,300 / US$ 22,600 in titanium (ref. 5527TI) or Euro 33,400 / US$ 33,800 in gold, either white (ref. 5527BB) or rose (ref. 5527BR). 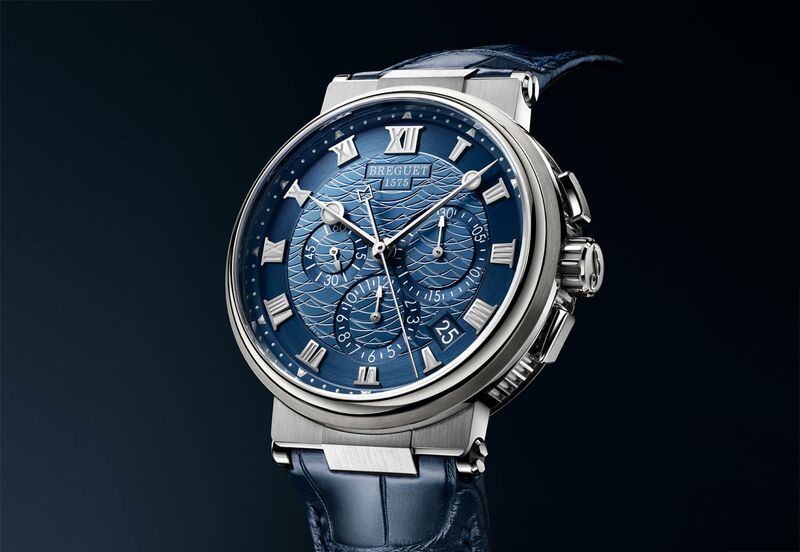 Breguet Marine Chronograph 5527.